Empowered by five years of experience in this domain, we are betrothed to manufacturer, distributor and trader Angular Contact Ball Bearings. The offered bearing in automobiles and machinery, the offered bearings are used to support the radial and axial high speed motion. The manufacturers that require such bearings are automotive products, precision machinery and parts. In order to manufacture the offered bearings, our adept use exceptional quality steel and metal alloys and advanced techniques. High Quality Steel – Ultra clean steel to extend bearing life by up to 80%. Advanced Grease Technology – NSK lubricants that can extend grease life and performance. High Grade Balls – Quiet and smooth operation even at high speed. Super Finished Raceways – Specially honed to minimise noise and improve lubricant distribution and life. Contact Angle – Offered in 15, 25, 30 and 40 degree angles. Cages – Available in a range of Polyamide, steel and brass cage assemblies. In our manufacturing, distributing and exporting unit, we bring forth for our clients a wide array of Angular Contact Ball Bearings. Offered bearings are made under the firm guidance of our deft professionals who go after industrial standards and strategy to deliver a flawless range at the clients’ end. These bearings are used industrial systems installed in steel mills, automobiles, power plants, engineering, FMCG, government and institutions. 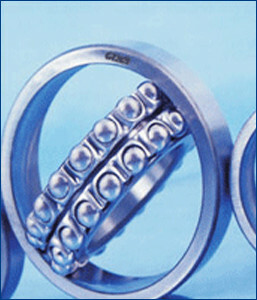 Clients can buy offered bearings from us in varied specifications within budgeted costs.